There is nothing like a three-day weekend of racing. Well, it's sort of like four if you include the post-lunch Friday afternoon online bets. Today, there are eight stakes races with prize money of at least $100,000. Six of 'em are Breeders' Cup Challenge Series races. Let's talk about the Belmont Sunday stakes races, sharing some of our insights and picks to click. The race fields a dozen two-year-old horses running 6-furlongs on the Belmont inner turf. The FUTURITY winner gets an automatic entry to the Breeders' Cup Juvenile Turf Sprint. If you read our Belmont Bias piece, you know that post position is a key factor over the distance/surface. "There have only been eight races, meaning the data set is slim. As a result, there is only one identifiable trend, six of eight winners ran from the four post and out. Otherwise, pace is split between early speed, stalkers and closers." And the bias is clearly reflected in our bonus commentary for pro-subscribers. "UNCLE BENNY [PP 11] broke his maiden as a big-time favorite in his debut. He's moving over to grass where trainer Jason Servis wins at 26% with horses making their first start on turf. DRAGIC [PP 6] is stepping down in class and making his second start on turf. Trainer Wesley Ward hits at 33% with the sprint-route-sprint angle. Today finishes the cycle. VETERANS BEACH [PP 3] has two starts on the grass with a win and a third. He should show some improvement in race number three. SWAMP RAT [PP 10] is making his third start after a short break. His trainer, Philip Gleaves, wins at 25% in third starts." The $400,000 FRIZETTE STAKES is another race for the unpredictable two-year-olds. Eight fillies will slug it out over a mile on the dirt. The winner of the 7th is going to the Breeders' Cup Juvenile Fillies race. Reflecting on our Belmont Bias analysis, some important trends have popped off the past-performance pages. "Early speed is still the dominant bias, but not in wire-to-wire fashion. Only three winners managed to go w2w. However, 12 of the 18 to reach the tape first ran in the front three. Those are 1-2 like odds. Another 1-2 BIAS shows up in post positions, as well. Just like early speed, 12 of 18 winners left the gate from posts one, two, or three. That's by far the heartiest trend, inside early speed types must be strongly considered at your top choice on all tickets." After putting pen to paper, digging through the data, and applying the special sauce, our handicapper believes the better horses will overcome the inside speed, inner post-position edge. "COVFEFE won her debut with class. If she runs the same race, she'll be the class of this field too. NONNA MADELINE had a couple of excuses in her last race. Trainer Todd Pletcher wins at 27% with horses stretching out for the first time. GRACEFUL PRINCESS won her debut and was "uncontested." She probably has more than she showed in her first race, expect to see it today. JAYWALK has shown she can close or wire 'em. That's usually a sign of a quality racehorse." Race 8, the $500,000 FLOWER BOWL STAKES, closes out a pick-three and the third leg of a pick-four. It's going to qualify a young-lady for the Breeders' Cup Filly & Mare Turf race. Seven fillies and mares, three-years-old and upwards, will race 1 1/4 miles on Belmont's inner turf. Meet-to-date, there have only been three races of this sort, so you can't make much of the data. It's insufficient to come to any conclusions. For what it's worth, two of the three winners showed early speed, but none went gate-to-wire. While this surface and distance doesn't have an identifiable bias, it does include a horse who appears to have a bias for Belmont turf, including the inner turf. Our bonus commentary says, "FOURSTAR CROOK has won six of seven at Belmont, including her last three on the inner turf. TRICKY ESCAPE is one of two speed horses in the field and will probably lead the way into the first turn, which could be a big advantage. HOLY HELENA ran twice on the Belmont inner turf, closed hard both times with a win and a fifth. 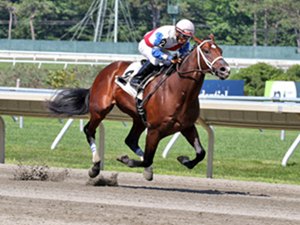 ONTHEMOONAGAIN is making her third start in the US and enjoys the top trainer/jockey combo." With that sort of track-record, FOURSTAR CROOK could be the freebie in the pick-four and to close out the pick-three. Or, maybe go two deep just in case the big-time fav falters, jacking up payouts. GET OUR FULL CARD BELMONT AND KEENELAND PICKS!